The story of the Colts Armory Press begins with Merritt Gally, a press maker in New York. In 1869 Gally patented his Universal Press, the predecessor of the Colts Armory press. The Universal was manufactured at the Colt’s Firearm Company of Hartford, Connecticut, maker of the eponymous Revolver and known to many as “Colt’s Armory.” Around 1885, John Thompson redesigned Gally’s Universal, naming the new press after the factory in which it would continue to be built. 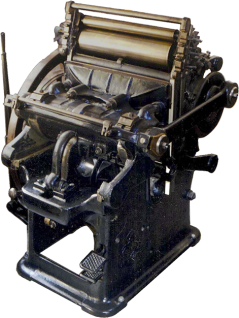 Instead of the rotating-disc inking system found on most platen presses, the compact and powerful Colt’s Armory Press uses a set of rollers, some of which oscillate, assuring superior ink distribution. The press also has a platen which slides and rocks along a rail, rather than pivoting on a central hinge. This allows perfectly parallel travel toward and away from the type bed.